As the only daughter of Queen Elizabeth II, Anne is a hardworking and significant member of the royal family. And as such, she needs quite a few tiaras in her arsenal for the state events she attends. While Anne’s two other major tiaras — the diamond meander tiara of Alice of Battenberg and the aquamarine pineflower tiara that belonged to the Queen Mum — were legacies from her grandmothers, the diamond festoon is a newer piece. It was given to Anne in 1973, the same year that she married her first husband, Mark Phillips. But it wasn’t a wedding present; it was given to the princess by the World-Wide Shipping Group, a Hong Kong firm, after she christened one of their ships. 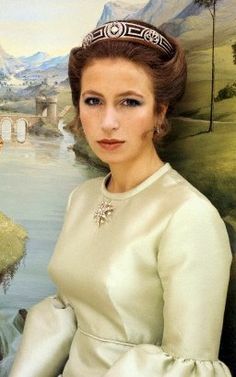 Anne has worn the tiara on a regular basis since she received it, and in 2008, she loaned it to her daughter-in-law, Autumn Kelly, to wear as a wedding tiara (pictured above). Autumn anchored her veil with the diamond festoon for her wedding to Peter Philips in Windsor that May. Delicate, with just enough height and enough fullness to be visually pleasing, I think this one was an excellent choice for a bride marrying the grandson of a monarch.